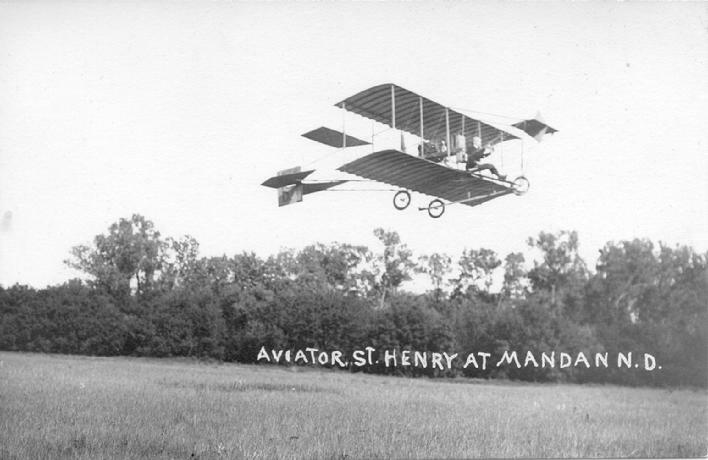 Enjoying a perfect day, with barely a breeze, thousands of area residents attended 1911 Missouri Slope Fair and witnessed an airplane demonstration from the barnstormer Robert St. Henry. Out of the thousands in attendance, not more than 20 had ever before seen an airplane. 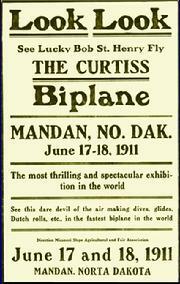 The Curtiss biplane, nicknamed "Sweetheart," was on exhibition in a hangar near the entryway to the grounds. More than a thousand people paid the admission price of 10 cents (equivalent to $2.30 in 2010) to enter the tent to view the aircraft and hear an explanation of the machine's operation. 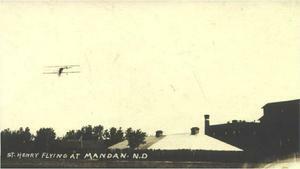 After the afternoon fair sponsored baseball games, "when all was in readiness for the flight, the grandstand was emptied, and the crowds lined about the track or took places on the knolls around the grounds, the better to see the flight. In addition to those on the fairgrounds, the hill tops about the city were black with people who, without cost to themselves, also enjoyed the show." According to a newspaper report, �The biplane was wheeled to the north end of the plat between the race tracks, and after the mechanism was tested out, "Lucky Bob" St. Henry took his seat, and the machine was off! Skidding along the ground for perhaps 200 feet, the aviator adjusted the levels and, with the grace of a bird, he was sailing in the air over the grandstand, rising to a height of perhaps 200 feet. Circling to the west and southwest, he made the turn when about a mile from the starting point and landed back in the closure - as easy as falling off a log." Robert "Lucky Bob" St. Henry (whose real name was W. C. Shaefer) was born in Nebraska in the 1880s. Described by his relatives as a "free spirit," he was an early American barnstormer who lived in a number of places around the country. 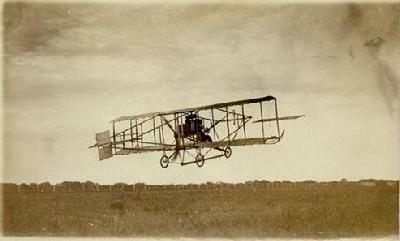 Glenn Curtiss, founder of the aircraft company which bore his name, sponsored a flying team of which Shaefer was a member, which flew around the country promoting his aircraft designs. The 1911 fair also included the more traditional entertainment, agricultural and athletic events. The Cole Carnival Company, which had arrived on Friday night, pitched their tents on the space just west of the electric plant on Main Street (site of today's Papa John's Pizza). Just after noon upon arrival of a special train from Bismarck with several hundred passengers from across the river, the carnival band led the way to the fairgrounds. Admission to the fairgrounds was 50 cents. The grandstand was packed for the attractions each day. The excited crowd cheered their favorite players in the baseball games featuring the teams of Glen Ullin who defeated Bismarck on Saturday; and Mandan, who defeated New Salem, on Sunday. The directors of the Missouri Slope Fair and Agriculture Association went into the exhibition backed by a guarantee from Mandan businessmen to $1,000. The receipts from the airship exhibition were: $1,670; from concessions, $55; from the Carnival, $81. Out of the grand total of $1,806, St. Henry and his assistants were paid $1,282, and after paying about $100 in miscellaneous expenses, the Fair association made a profit of about $400.